This is the third in a series of posts that I am writing about the tech industry geniuses, through their endless benevolence and brilliance, giving their end users “features” that do nothing to improve the user experience. Contrarily, these “features” get in the way of productivity and, many times, cost users precious time as we then have to figure out a way to disable the wonderful gifts that have been freely bestowed upon us by high-paid nerds with too much time on their hands. Yet another example of this is something that is being called “Aero Snap”, which is something that I first noticed in my computer, running Windows 7 Pro. I don’t believe the “Home” version is plagued by it. It was expanded in Windows 10 to include suggested apps that pop up to assault you, after Microsoft forcefully resizes your windows. This was given a nice-sounding name of “Snap Assist”, probably because every time you experience it, it makes you want to go crazy. As we explained more in depth in our previous post, our top goal for the Aero Snap feature is to provide you with an effortless way to position your windows the way you want them. We want to reduce the number of clicks and precise movements needed to perform common activities. In a general sense, we want you to be able to manage your windows with confidence and create a feeling of power and control. This is something we touched on in our post on the Windows 7 taskbar as well, and really a theme that weaves through much of our new desktop experience. A feeling of power and control? They have got to be kidding! Having my Windows maximize on me when I don’t want them to, does not make me feel like I have power and control. In fact, the exact opposite is true! Furthermore, this is not an “effortless way to position your windows”. In the past, I have “managed my windows with confidence” by effortlessly dragging them around, positioning them on the screen where I wanted them. I did so effortlessly right up until the Microsoft geniuses introduced Aero Snap which made it harder. This “feature” now causes my windows to do weird, unexpected things that I, then, have to undo. It gets in the way, and it’s annoying! It seems Microsoft has all of the power and control. Microsoft claims this “feature” is very popular. Perhaps so, but the people I talk to tend to despise it as much I as do. I mentioned disabling it to my boss, for example, and he enthusiastically said “oh, you can turn that off?” Hence, I suspect Microsoft may not be hearing the countless number of people who are, undoubtedly, grumbling beneath their breath every time the OS takes control of their Windows and resizes them against their will. The good news is that there is, indeed, a way to turn it off. 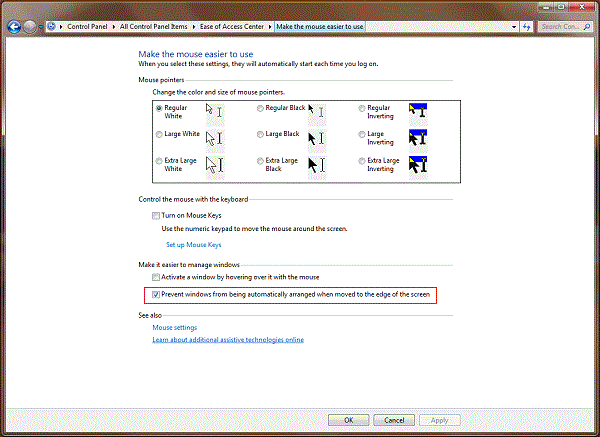 In Windows 7, go to Control Panel > Ease of Access Center > Make the Mouse Easier to Use. Check the box that says “Prevent windows from being automatically arranged when moved to the edge of the screen”. Then, go to Control Panel > Ease of Access Center > Make the Keyboard Easier to Use, and make sure the same box is checked. To disable it in Windows 10, go to Settings > System > Multitasking and use the switches to adjust the settings to your liking. Tech geniuses should be working at making things easier, adding to productivity, instead of introducing so-called “features” that cause problems or annoyances that we then have to research and work to get rid of.